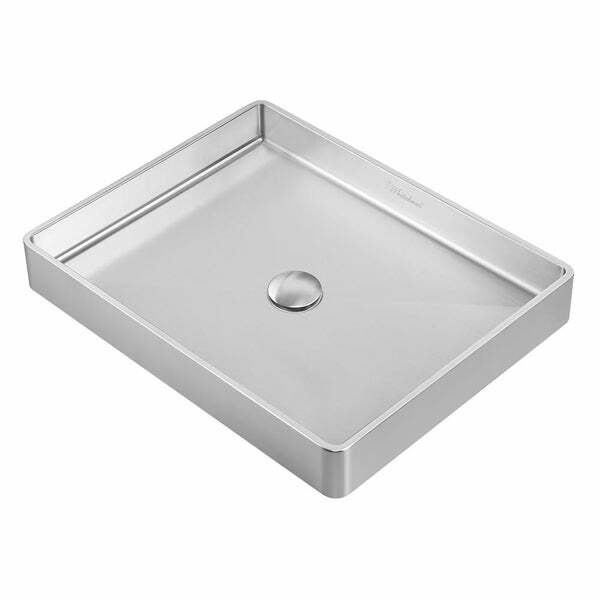 Noah Plus stainless steel sinks are constructed out of 18 gauge, industrial grade 304 stainless steel providing the highest quality, durability and resistance to corrosion. With its "near" zero radius corners cleanup and buildup remains at a minimal, keeping the look of your sink as captivating as ever. Noah Plus Bath stainless steel sinks all are equipped with center drain location and four diagonal groves for efficient draining. These sinks also feature a 10 gauge frame, noise reduction dampening pads and full undercoating for further sound proofing and protection against condensation and noise. Noah Plus is offered in your choice of various finishes, from favorable Brushed Stainless Steel to dynamic electroplated finishes such as: Brushed Copper, Brass and Gunmetal. Also offered in a bold and stylish matte black textured finish. Redefine your bathroom with a Noah Plus Rectangular Above Mount Sink with matching drain. Dimensions 20.5 In. X 16.0 In. X 3.0 In.